Cold boiled meat (beef or chicken), salted cucumbers without seed and skin, the prunes washed and stoned are cut with shallow blocks. 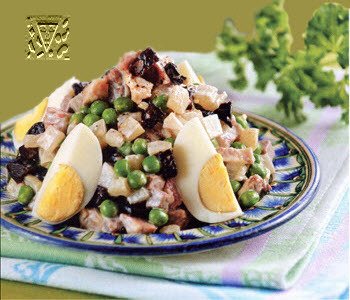 Foods are laid in deep tableware, add a green pea, mayonnaise, salt, pepper, all be well mix and lay in a salad-dish a hill. Salad is decorated by egg quarters, canned fruit and greenery. Composition: meat - 50-60 g, salted cucumbers, green pea - 30 gs, mayonnaise - 40-50 g, eggs - 1 th., canned fruit - 40- 50 g, prunes - 20 g, salt and pepper to liking.